NATIONAL HEADQUARTERS – Civil Air Patrol’s Board of Governors approved an updated Constitution and Bylaws on Monday. The document incorporates the organization’s new governance structure. The governance changes streamline the organization’s decision- and policy making processes; clarify the role and responsibilities of key personnel; incorporate a new selection process for CAP’s National Commander and other executives; change the composition of the CAP membership on the BoG; and extend indemnification to all CAP members who were previously indemnified. 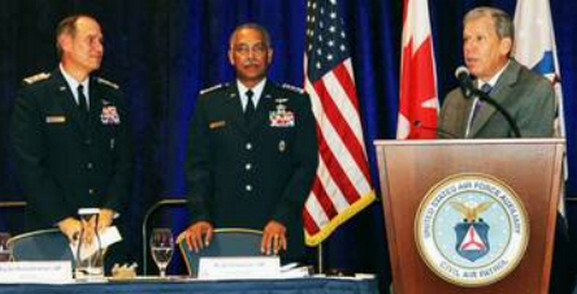 Members of the BoG’s Governance Committee – Maj Gen John Speigel and Brig Gen Sanford Schlitt and CAP National Commander Maj Gen Chuck Carr – received input and recommendations from CAP’s Constitution and Bylaws Committee, and this information was considered by the BoG in finalizing the document. The Constitution and Bylaws Committee consisted of five members – Col Russ Chazell, CAP’s National Chief of Staff; Col Bob Karton, Great Lakes Region Commander; Col Barry Herrin, Chief of CAP’s Legal Corps; Rafael Robles, CAP General Counsel; and Susie Parker, Chief of Personnel and Member Actions. Secretary of the Air Force Michael Donley commended the new organizational structure: “I have carefully reviewed the changes and believe that the rules of governance bring clarity and consistency to implementation of the structures and procedures as set forth by Congress,” he wrote in a Sept 24 letter to Brig Gen Rich Anderson, BoG Chairman. Be the first to comment on "Board of Governors Updates CAP Constitution"
When I started complaining, they said bye, bye. People are scared to death. If they want to stay in the Civil Air Patrol, they keep their mouths shut.